What is LOVE, Dr. Cookerly? : The Huge, Hidden Reason So Many Fail at Love? Synopsis: Rediscovering a ‘becoming invisible’ cause of our huge number of love relationship failures starts this mini love lesson. It then is followed by a listing of 12 major love failure syndromes; the best source for learning about all this; more. Did you know that 50 and more years ago there was a widely accepted but mostly now forgotten reason for failing at love. This reason was commonly understood and very helpful in protecting people from many of the traumas and tragedies which now beleaguer masses of those struggling to make their love relationships work. What was that reason and its accompanying solution? Before we get to that, let’s give a couple of clues to see if you can figure it out. Clue 1. Are you aware that once upon a time the most popular magazines list included titles like “True Love”, “Real Love”, “True Romance” and “Real Romance”? Clue 2. Have you heard these terms: twitterpatted, smitten, having a crush, amentia, bewitched, gaga over, enamored, beguiled, stupefied, calf love, puppy love, spellbound, infatuated, gone dottie over, and love crazy. Clue number 1 helps us see there was a widely accepted implication that untrue love, unreal love and/or false love really and frequently existed. The words and phrases of Clue 2, and others like them, were all terms used to indicate various versions of that same thing – false love. They also were widely used to help a person not jump to the possibly, disastrously, mistaken conclusion that one was entering into a state of true or real love. In other words, false love was seen to be a reality of perhaps multiple types, and everyone had best beware of false love because some of its forms might be highly misleading, very painful and quite destructive. It would seem, that was the common mindset. Somehow, strangely, the subject of real versus false love is not much looked at these days. For many that means the protection this concept gives is no longer acting as a safeguard. Typically now, too many people quickly conclude if “it feels like love, it must be love” and in fact it must be real, true and therefore, highly desirable and dependable, healthy love that will last. More times than not, this conclusion can be flat out wrong. So what is happening and what can be done about it? Perhaps the reasons for a 50% or higher divorce rate and an estimated 75% love relationship breakup rate in many countries may be due to false love. The solution to false love, of course, is real love, learning how to tell the difference and how to stay away from the false thing, and instead, do the real thing. Couples whose relationship is based in a false rather than a healthy, real love are bound to experience one kind of love failure or another. It seems this used to be well understood and broadly recognized. It also seems those who worked with this conceptualization better protected themselves from the many failures inherent to false love. It likely is that such couples who do this now can be much more successful in finding, developing, creating and growing real love and, thereby, attaining its many healthful and more lasting benefits. With this thinking, would it not be wise for those who teach and write about love to once again contemplate, do research and put forth information and ideas about false versus real love? Isn’t it time that once again we shed light on that which has slipped into the shadows and has become again a sort of secret. It seems like a mysterious truth is being kept from the vast number of people who dearly need to avoid or escape from the living disasters of love going wrong. Shouldn’t it be proclaimed that there is healthy, real love but there also are toxic forms of false love that can harm and even destroy your life? Isn’t it also true that the more we look at love relationship problems in this light, and the more we learn how to recognize the differences between real and false love, the better off we all will be? Below is a list of a dozen forms of destructive, false love patterns or syndromes thought to exist by investigators, researchers therapists and others of notable expertise. It was compiled from work done in a broad array of fields by a wide variety of those who give serious thought and effort to these issues. Each is accompanied by a very brief hint about what some of these false love forms have to tell us. In my long practice as a relationship focused therapist, I discovered that hundreds of individuals, couples and families benefited greatly by working with the concepts involved in the real love versus false love issues. My international work showed me the real love versus false love factors were applicable worldwide. From my extensive experience, every kind of love relationship problem bears at least some examination viewed from the perspective of real love versus false love issues. Especially is this true for every individual and couple wanting a romantic relationship or involved in one, as well as those recovering from a failed love relationship. 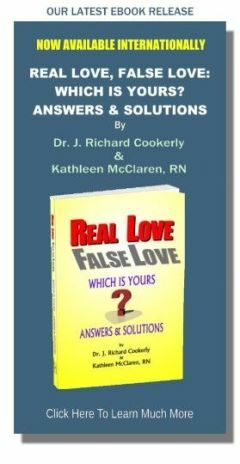 It is with that background and the reasons involved, that my ‘40+ years, love mate/partner, Kathleen McClaren, RN’ and I wrote the e-book REAL LOVE, FALSE LOVE: Answers and Solutions (currently exclusively available at this website). This book covers the above named and listed 12 Syndromes, complete with amazing and inspiring case histories and the how to’s of avoiding, escaping and recovering from false love, along with, and when possible, how to change false love into real love. Yes, of course, that is a plug. But it really is a fine book presenting highly engrossing and useful information you will not find all together anywhere else. And from the feedback we are getting, REAL LOVE, FALSE LOVE is doing lots of deep good for its readers. 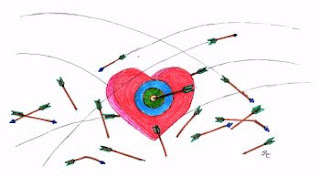 ♥ Love Success Question: Do you know and can you tell the differences between healthy, real and toxic, false love?